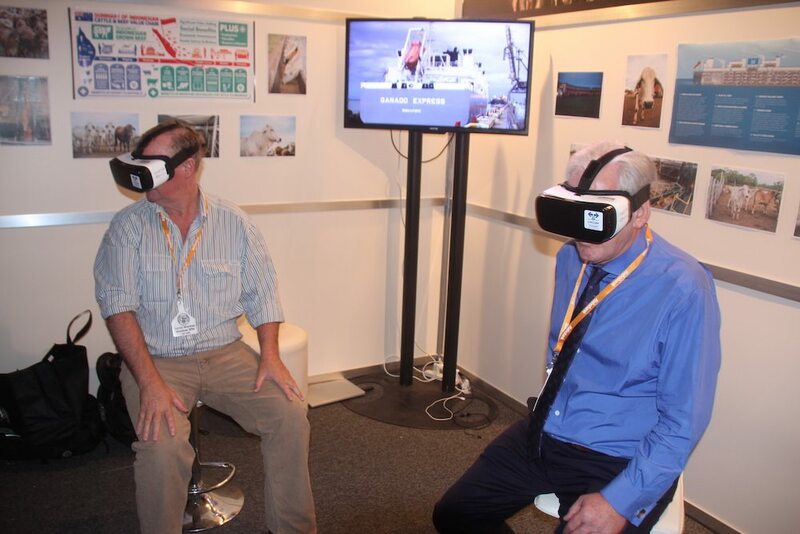 NTLEA president David Warriner and former Australian trade minister Andrew Robb try out the Virtual Reality tour of a live export supply chain at the NTCA conference in Darwin last Friday. Sit down on a stool at a conference, attach a headset over your eyes, and suddenly you’re standing in the middle of pre-export quarantine facility, watching cattle move around you as they are loaded onto a road train. Wherever you turn your head, the vision turns with you. Follow a single steer with your eyes, and it doesn’t run off the screen – you can watch it all the way onto the truck. Soon you are travelling on a road train through the streets of Darwin, and then viewing cattle walking up loading ramps and into pens on-board a livestock ship. The experience is so immersive you have to lift the headset from your eyes just to remind yourself you are in a trade booth at a conference, not walking through cattle yards or onto a live export vessel. The experience was made possible by the innovative use of 360 degree cameras and virtual reality by LiveCorp, the levy-funded live export industry service provider. Anyone who walked by the LiveCorp trade booth at the NTCA conference would have noticed conference delegates sitting on stools and staring into enclosed headsets, moving a little like astronauts on the moon as they adjusted to and interacted with their new visual environment. 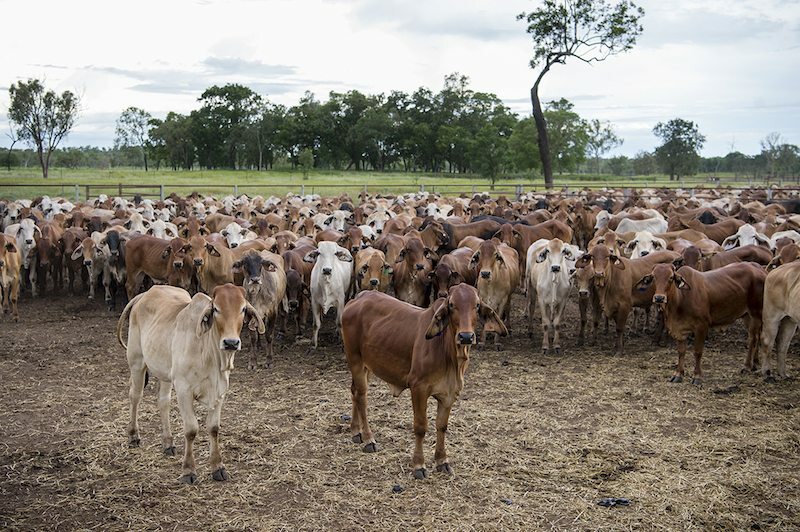 LiveCorp is the smallest Rural Development Corporation, but has a large and diverse audience, and a long supply chain extending from producers in Australia through to feedlots and abattoirs in overseas markets. A still from the vision shown by the 360 degree camera in the pre-export quarantine yards. LiveCorp CEO Sam Brown said the organisation is constantly looking to find better, more effective ways to communicate, engage, train and extend the uptake of its R&D. The idea of using 360 degree cameras grew from LiveCorp staff sharing their ideas and experiences with developments in gaming and the expanding online and social media use of 360‑degree footage. “When we considered how this technology could be applied within our industry, we were immediately drawn to its potential to enhance LiveCorp’s training services and as an innovative means of extending R&D and communicating in a more engaging manner. “The ability to immerse people and allow them to interact with the environment opens up substantial opportunities for effective engagement. Mr Brown said the 360-degree footage and VR headsets could be used to enhance many of LiveCorp’s training services for on-board stock people, approved arrangements and ESCAS education. “We see a lot of potential to use the 360 degree footage to show different angles and perspectives of different activities and processes. This opens up the opportunity to improve our training methods and tools and the benefits of a more engaged experience in a learning environment could be substantial. In future Mr Brown said LiveCorp hoped to use the technology to capture further on-board footage of cattle on a vessel including discharge at the destination and documenting the loading process and on-board a sheep vessel. Positive and innovative adoption of technology which can create transparency. Sorry I missed it.